Local Historical Societies value contributions of photographs and other material about people, places, and events in their community. The OAHS was recently the recipient of an act of kindness when an item was returned “home” to Oregon. 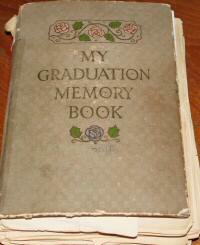 A woman in Arizona found a graduation booklet at an estate sale. She recognized the value of the booklet, purchased it, phoned the OAHS, and sent the booklet to us. This booklet was compiled by Marvel Morrison in Oregon, WI. The handwritten account of her high school years and the class of 1925 is a real treasure. The booklet contained many new images, which we now have in our collection. Before your items end up at a yard sale or in the trash or a dumpster, consider donating to the local historical society where your people lived. If someone in your family wants to keep original photographs, consider sharing copies with your historical society. Do not underestimate the value of your Oregon-related items. We need your help to collect, preserve, and share the history of Oregon. Do You Know Family History? Add them to our growing number of family history files. Do You Have Stories of the Past? Reminisce with one of our Society members, recording the events of the past and how you and your family played a role in them. If not you, perhaps you know someone who would enjoy sharing their experiences. Are You Able to Donate Photographs? Help us collect & preserve the history of the Oregon area. You are an important part of the history of our area! Please call us at 608.835.8961 or email us at info@oregonareahistoricalsociety.org.